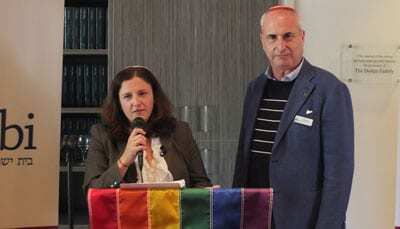 The third annual ‘Pride Shabbat” service has been held at Melbourne’s Temple Beth Israel (TBI) in Victoria, as part of the 2016 Midsumma Festival, an annual event held to celebrate Lesbian, Gay, Bisexual, Transgender and Intersex (LGBTI) art and culture. Jonathan Barnett, president of Keshet Australia, an organisation committed to overcoming prejudices, said: “The Pride Shabbat It’s all about bringing back LGBTI Jews into the community.” He believes that there is a growing belief that people cannot live as practicing Jews and members of the LGBTI community at the same time even though they want to celebrate their Jewish heritage. 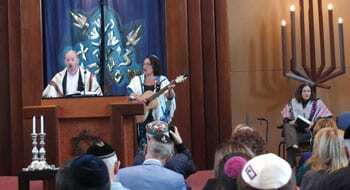 To highlight this open-mindedness prayers such as “A Queer Amida,” were read from the San Francisco LGBTI Siddur by different members of the congregation. Margot Fink a transgender woman and State Finalist Young Australian of the Year spoke about her journey, being incorrectly assigned male at birth, yet identifying as female. She discussed her coming out and unconditional acceptance of her sexuality by her family and the Jewish community. This support allowed her to be a proud transgender Jewish woman and events such as the Pride service is in an “olive branch,” making Judaism available to everyone regardless of their gender. Over 200 people attended the service, including David Southwick, State Member of Parliament for Caulfield and Victorian State Minister for Equality Martin Foley. Keshet will host a pride Shabbat picnic. Oh Dear Eleonora, didn’t Jesus teach you to love all in God’s world. If you are into labels and you like being in the Messianic Jews ‘tribe’. For Gods sake be more like how Jesus asked us to be. Go Jesus ! Go Temple Beth Israel! Wow what happened to God’s word??? It’s an abomination in the eyes of God. Seems that even we Jews are now Tampering with His words. Thank God I’m a Messianic Jew. Oops before you all start yelling at me… I believe all scripture Old and New are God’s word. Let’s leave it in God’s hands who is or isn’t one of His people. You can imagine my surprise when I put a drop of my blood under a microscope… it wasn’t round like normal corpuscles but shaped like the Star of David. Either I’m Jewish or I’m a very very sick old lady. PS No matter what you believe, God gave us all the freedom of choice. If you’re Hebrew you are still and always will be my family. That cannot be pleasing to God. The people in the second photo are Cantor Michel Laloum and visitor,Cantor Zöe Jacobs, from Finchbury Reform Synagogue (North London). Correction, please.